Unfortunately, if you live in an apartment, your options are limited. You can’t easily add an extension to give your bathroom the depth it needs. More importantly, you can’t consider making one room bigger without having to give away precious space from the surrounding area. In other words, to get a bigger bathroom, you need to sacrifice your bedroom, kitchen or lounge. Is your wet room really worth the hassle? There’s no point denying it: Our media obsession — from films to interior style magazines – has encouraged our taste for grandeur. You can’t have a small bathroom because you are surrounded by images of spacious and elegant wet rooms that shape your mind to specific expectations. But the truth is that when you live in a small house or apartment, all you get is a tiny bathroom. Of course, you hate it. As far as you’re concerned, there is nothing you can do to improve the room. It’s so small it is almost suffocating! But don’t let your emotions get in the way of creative thinking and smart styling. Yes, a small wet room can be challenging. But with a little effort, you can make it work! The first lesson you’ll have to learn is to wave goodbye to some of your beauty gear. Indeed, even the most passionate and dedicated cosmetic lovers tend to own far too many items. Unused mascara, creams, and other beauty products tend to dry out and become unusable without a few months. Additionally, when your beauty gear fills the entire cabinet, you might accidentally stumble across products that are long past their expiration date. What are you keeping these for? You need to declutter your beauty cabinet thoroughly, starting by organising your belongings into piles of products that are not suited for use – because too old, or too dry – and those that are still usable. Then make sure to eliminate everything you don’t use regularly enough as these are taking unnecessary space. You might want as well to dive at the core of your skin and beauty issues. For instance, if your makeup routine is only about hiding skin issues, it’s best to invest in skincare products than makeup. Finally, semi-permanent products can help you to streamline your beauty routine, and manage your bathroom cabinet! Less is more when it comes to beauty, and it can free up tonnes of room! Granted, when the bathroom is tiny, you don’t want to waste any space with ugly and unpleasant items. The first thing that disappears in a small bathroom is the indispensable bin. Sure, you can get your waste into any of the other bins in your home, but in reality, most people flush everything down the toilet. And that’s precisely where your problems start. From tampons to cotton balls and hair, your toilet is forced to evacuate a variety of bathroom wastes that can build up into a blockage. The last thing you want to do during your evening is to put your rubber gloves on and read how to unblock a toilet drain online. Not quite the relaxing night in you had in mind, right? So, don’t take any unnecessary risk. 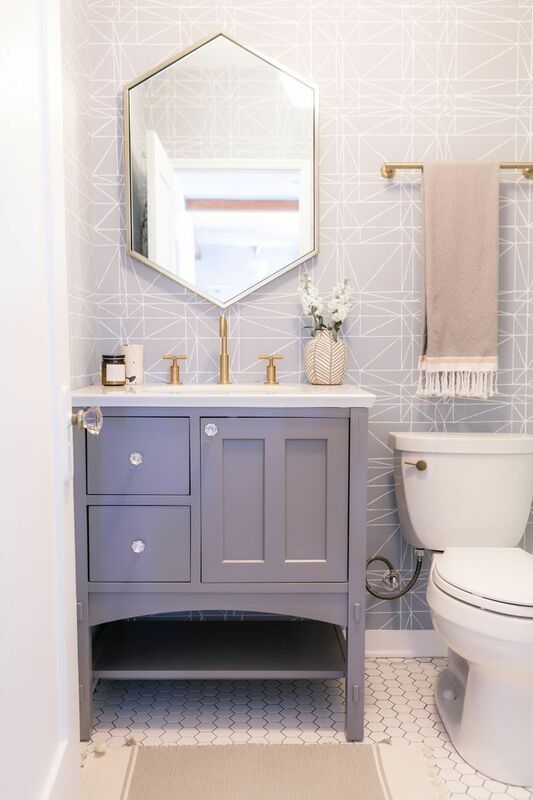 You can find super cute designer bins that are perfect for the bathroom. Brabantia, especially, is a brand that specialises in vintage looking pedal bins in many colours, including pink and pale yellow. If you can’t extend the room, you can change your perspective with paint and tiles. Indeed, experts recommend creating monochromatic bathrooms to give the impression of infinite space. Avoid dark hues and focus instead of light and bright colours such as icy blue, soft green, pink and aqua. Keeping your palette colour in the same tone, by coordinating your tiles, floor and ceiling with the wall paint can avoid contrasts. To the eye, the walls, ceiling, floor and shower area will blend into one space. You can also add playful patterns, such as stripes. Vertical stripes will make a low-ceilinged room appear taller and horizontal stripes make the walls look broader. Small bathrooms often have no window at all, which can make it tricky to ventilate the room each time you take a shower. An integrated ventilation system is indispensable, but it’s not always sufficient. Consequently, many small bathrooms tend to struggle with mould patches growth, which makes the room less appealing. You, of course, need to tackle the mould directly by using the right cleaning products. But how do you stop it from coming back without turning the bathroom into a chemical war zone? Two words for you: Peace Lily. Indeed, some houseplants, such as the Peace Lily but also others, can actively absorb the moisture in the air. They also are an elegant addition to the bathroom. Your shower cubicle can make the room appears smaller as it creates a cut in the design of the space. But have you considered removing the old unit and building a walk-in shower instead? If you use tiles on the wall, you can seamlessly transition into the wet area without dividing the space. The addition of a stylish glass wall can keep the water out of the bathroom area without creating unnecessary division. Last, but not least, there is no bathroom without a decent mirror. For a small bathroom, opt for a unit that can cover the wall, as it will bring depth to an otherwise tiny space. Ditch the vintage round shape and pick a modern rectangle that adds a crisp finish. Falling back in love with your tiny bathroom is a matter of extreme urgency! The better you look after it, the easier you’ll find it to get ready in the morning. After all, looking your best starts in the bathroom.